Wahoo! The day has come! As an Acara enthusiast, the Acara Aquatic Festival is my favorite day of the year. Not only is it a wonderful day to honor these adorable pets, but it is also a day of fabulous clothing and items, both old and new. For such a prestigious festival, it may be overwhelming to some owners who are wondering how to dress their Acara, but fear not, for I have created a lovely wardrobe guide! With so many options, there are so many different ways to dress, but hopefully this guide will point you in the right direction, depending on the unique personality of your own Acara! Acara Festival Gown + Acara Festival Ribbons + Acara Festival Sandals - no mixing and matching here, these items are part of a beautiful set, allowing your pet to shine in shades of blue. Don’t forget a pretty background to go with it! I suggest something simple, to allow the outfit to shine today, but with such a fancy Acara, they may even want that to be extravagant as well. Royal Girl Acara Gown + Royal Girl Acara Hat - reserved for your Acaras painted in this color, this outfit is a must wear on this day. Not only does it fully match the color they are painted, but it is such an exclusive color that wearing the traditional dress shows off just how fancy your Acara is. If you fabulous, fancy Acara happens to be a boy (and a Royal Boy at that), use the combination of Royal Boy Acara Robe + Royal Boy Acara Necklace + Royal Boy Acara Crown, and he will look dapper and feel even better! Notice how these are not full outfits - your Acara will not feel unlike themselves, weighed down by several pieces of clothing. Any of these combinations will look lovely, while avoiding the stress of overdoing it. No matter what personality type your Acara is, remember that it is their special day and their time to shine, so listen to what they really want. It is important that we make them feel fabulous while also honoring their true personality - their individuality is what makes them so great! While I have given many choices and combinations of outfits, keep in mind there are so many more clothing options out there. Many options are not specific to Acaras (like the ones I mentioned above), but can still look very stylish and fashionable! And while I covered the clothing aspect, remember that backgrounds and foregrounds are also great ways of individualizing your pet - just make sure they aren’t too ornate and take away from your pet! Rule of thumb: The Acara should ALWAYS be the center of attention. If you’re looking to add even extra for your Acara, don’t forget to look into banners, string lights, things to hold, and little friends. Is your Acara feeling nervous about the festival? Maybe they’d like a Baby Faellie Plushie Friend to join them! Does your Acara want to look powerful? Have them hold a Staff of Justice! The options are endless. I’m looking forward to seeing all the creative wardrobe choices you and your Acaras make for the day. 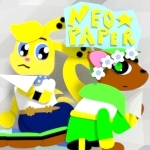 Take lots of pictures and share your creation with Neopia!